This past fall, NBC attempted to bring John Constantine - conman, magician, and thorn in the devil's side - to the small screen as part of the glut of DC properties that suddenly sprang to screen. It lasted 13 episodes, which I covered here, and was the only of the DC shows not get renewed. The reasons for this are many, but boil most essentially down to: it was on NBC, and it wasn't that good. It flipped flopped heavily between having a great deal of promise and being frustratingly directionless. It was leagues better than Gotham, but it being on NBC really was the most significant nail in it's coffin. One thing that was not in question was the quality of the performance of the lead, Matt Ryan, who inhabited John so completely, I would rank it as one of the most successful comic book character portrayals ever. Like, with Christopher Reeve and Robert Downey Jr. It seemed that John had stepped directly off the page of the old Hellblazer book, despite being surrounded by a show that didn't deserve his performance. NBC didn't like the show, as is their way, and ratings suggested that viewers had the same issues with inconsistency that I did. One hardened fan however, was Arrow's Stephen Amell, who had said he'd be game for a cameo if NBC renewed the series. 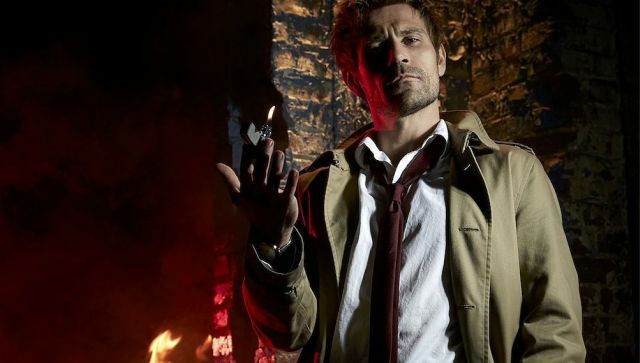 They didn't do that, but the adoration for Ryan was shared by the producers behind the scenes - producer and showrunner Marc Guggenheim saying of the idea after Constantine's cancellation, "It would be wonderful and we certainly have a million ideas... It comes up in the writers’ room constantly" - because this week we found out that Ryan will be reprising his role as Liverpool's most disheveled matchstick man in Arrow's Halloween episode this coming season, titled Haunted. CW boss Mark Pedowitz describes how Haunted came together, seeing as Johnny appeared on another network, as "The series is no longer on the air, and luckily one of our parent companies, Warner Bros., was the production company for Constantine, and we worked with them, and it's a great one-shot episode" which will see "a character...resurrected." Guggenheim added that the episode will have repercussions for the forthcoming crossover series Legends of Tomorrow, teasing that, "unlike Thea, who wasn't fully dead, the consequences of using the pit on someone as dead as Sara [Lance, the Black Canary] was creates some unforeseen difficulties, and John Constantine is uniquely suited to help our team deal with those." Co-showrunner Wendy Mericle added to that, "we knew Sara was coming back and we wanted to have her soul… she needed to be resurrected, and even in the world of the comic books, he's the guy to do it. We weren't sure it was all going to work out, but DC was very generous and Matt Ryan's schedule worked out and we're very excited." This is very exciting news, and not just because Ryan absolutely deserves to appear as John in a series that matches his performance, but also because this adds an entirely new dimension to the Berlanti DC Universe that has not been touched on by either Arrow or the Flash: magic. The one place DC truly excels over Marvel is in their depth of magically associated characters. And if Constantine's appearance opens up the possibilities of characters like Zatanna, Deadman, Etrigan or any other of the so-called "Justice League Dark" to appear in Arrow, Flash or Legends, then I am aggressively in favour of that. The CW's official synopsis of Haunted is "John Constantine is a weather worn exorcist and expert on the supernatural and the occult. He is a detective, magician, and a hunter of demons, and will provide critical support to Oliver (Stephen Amell) when arrows aren’t enough." It will air on November 4th. Via Collider, Variety, io9, and EW.